In just a few short days, USA Network's critically-acclaimed drama series Mr. Robot returns for its second season, with the two-hour season premiere airing Wednesday, July 13 at 10 PM ET. 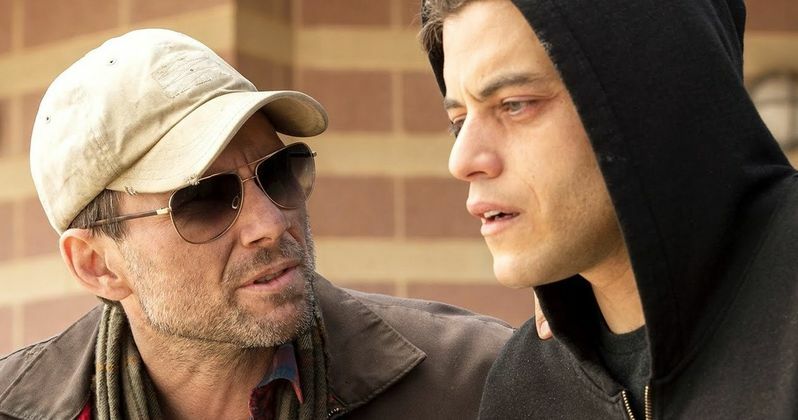 The show was a breakout success last year, with series star Rami Malek landing Golden GLobe and SAG Award nominations for his performance as Elliot Alderson. If you haven't quite caught up with the series yet, USA Network has released an extended recap of the entire first season. Be warned, though, this video will reveal every single plot twist from Season 1, so if you aren't caught up yet, there will be plenty of SPOILERS in the video below. For those of you who are caught up with Mr. Robot, USA Network is hosting a live Q&A on Facebook tonight, starting at 7 PM ET/4 PM PT. The Q&A will be hosted by Keegan Michael Key, featuring series stars Rami Malek, Christian Slater, Carly Chaikin and Portia Doubleday. USA recently increased their Season 2 order for Mr. Robot from 10 episodes to 12, with every episode directed by series creator Sam Esmail, who directed three episodes of the first season, including the season finale. Fans can log onto the show's Facebook to ask their questions, which may be answered during the live Q&A session later tonight. Mr. Robot follows Elliot Alderson (Rami Malek), a young cyber-security engineer who becomes involved in the underground hacker group fsociety, after being recruited by their mysterious leader (Christian Slater). Following the events of fsociety's 5/9 hack on multi-national company Evil Corp, the second season will explore the consequences of that attack as well as the illusion of control. All of the main cast member from Season 1 will return, along with a number of new cast members. Mr. Robot stars Golden Globe Award and SAG(R) Award Nominee Malek ("The Pacific"), Golden Globe Award Winner Slater ("Nymphomaniac"), Portia Doubleday ("Her"), Carly Chaikin ("Suburgatory"), Martin Wallstrom ("Simple Simon"), Grace Gummer ("Extant"), Michael Cristofer ("Ray Donovan") and Stephanie Corneliussen ("Legends of Tomorrow"). New recurring guest stars include Craig Robinson ("The Office"), hip hop artist Joey Bada$$, Sandrine Holt ("Fear The Walking Dead"), Michael Maize ("National Treasure: Book of Secrets"), Dorothi Fox ("Run All Night") and Luke Robertson ("The Americans"). Returning cast members include BD Wong ("Law & Order: SVU"), Gloria Reuben ("Saints & Sinners"), Michael Drayer ("Vinyl"), Michel Gill ("House of Cards"), Ron Cephas Jones ("The Blacklist"), Sunita Mani ("5 Stages"), Azhar Khan ("Veep") and Ben Rappaport ("The Good Wife"). The drama hails from writer and executive producer Sam Esmail ("Comet") as well as Anonymous Content executive producers Steve Golin ("True Detective") and Chad Hamilton ("Breakup at a Wedding"). Take a look at the new Season 1 recap below, and be sure to visit the show on Facebook for the live Q&A session happening tonight at 7 PM ET/4 PM ET. We'll be sure to keep you posted with more updates on the show as the countdown towards Season 2 continues.